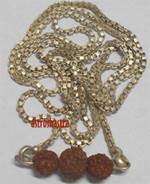 Mangal pendant consist of 3 beads of Three Mukhi Rudraksh with caps and chain. 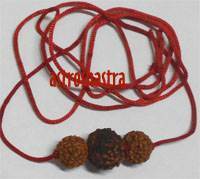 Three Mukhi Rudraksh protects the wearer against accidents, troubles and increases the intelligence and education. It is ruled by Mars and pacify evils of Mars viz. land, litigation, widowhood, blood poising and accidents. 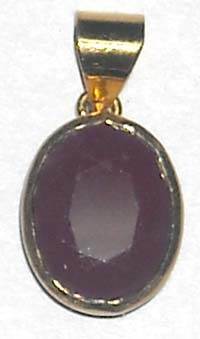 Mars controls the blood in human body, blood related ailments are cured by wearing this pendant. Planet Mars denotes courage, valour, anger, aggressiveness, arrogance, physical strength, risky pursuits, adultery, administrative capabil¬ity, leadership, command of an army, dominance, royal pursuits, injury, surgical operations and warfare. It has a bilious constitution. It rules over the musculature and bone marrow in the body. Mars also represents the brothers or siblings of a native, as also the southern direction. Heat, summer, burns and fire are also under the control of Mars. 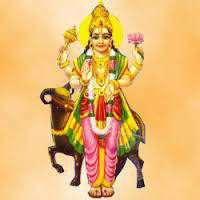 If one is Manglik or has malefic mars in his/her horoscope, wearing Mangal pendant definately helps. Thos who gets anger easily shall also wear this Pendant to appease Mars.